Happy holidays to all of you. 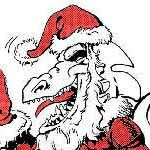 It is Christmas Eve and all that is stirring are a bunch of wacky artists, writers and game designers here at Palladium Books. We held the Palladium office party last Friday. It was an intimate gathering of the Palladium crew held at Kathy’s house. There was plenty of scrumptious food and drinks, gift-giving, and lots and lots of laughter. It was a nice break from the daily grind. I work with a great bunch of people, but you know that already. On Sunday, everyone came in to do some work so that we can take another long weekend for Christmas. Wayne was in to work on The Rifter and some business matters, Jeff went through his endless sea of email and rearranged part of the warehouse, Matt worked on writing and editing, and Alex and Julius on prepping and packing Christmas Surprise Packages. I came in to wrap more gifts, work on Surprise Packages and take care of some business before heading out to a neighbor’s Christmas party later that evening. That was a nice affair too. I think everyone is feeling the warmth and camaraderie of the holidays. Yesterday, I selected more goodies and signed more books for Christmas Surprise packages, paid some bills, and had a meeting with our printing rep. Wayne has been working on Rifter® #69 and the rest of the crew have been busy little elves signing books and working on various projects. Even though we have already announced that the Surprise Package offer has been extended till January 11, 2015, orders for it and other products have continued coming in at a rapid pace. Very nice. Thank you for your support. Of course, we made sure that the orders that came in over the past weekend ALL shipped out on Monday. Likewise, we made sure orders went out on Tuesday even if they won’t make it in time for Christmas. We are happy to see so many satisfied customers taking advantage of the Surprise Package offer again this year. It is a fun gift, even if it is for yourself. Keep ‘em coming. They make great birthday and anniversary gifts or a good way to fill in collections or try new settings. Thank you for your patronage and many kind words. I hope your holiday is filled with fun and joy. Every year, we debate whether or not we should extend the Christmas Surprise Package AFTER Christmas. And every year (so far), we extend it. Why? Because it’s the nice thing to do. We realize many of you are so full of the Christmas Spirit that you spend your money on gifts for your loved ones rather than yourself. This wonderful act of charity often leaves no money for you to buy a Palladium Surprise Package for yourself. We think that sacrifice is pretty awesome and what the holiday season is all about, so we extend the offer so that you selfless souls can pick up a Surprise Package after the holidays. We know this happens, because a lot people over the years have thanked us for the extension for this very reason. The extension is also for you Johnny Come-Latelies who are so caught up in the holiday frenzy, work and life that somehow you miss placing your order for the Christmas Surprise Package before the offer ends. It’s also for those of you who wish you had ordered one (or another one) but forgot. Lastly, it is our way to carry that holiday good cheer into the New Year. So get your post-holiday Surprise Package and enjoy. Please note that this offer will not be extended further. This is your last chance. Happy Holidays. The Rifter® #68 is full of good stuff and available now. Order yours soon. ‘Nuff said. A preview of the Rifter® #68 is now available on DriveThruRPG.com, and we’ll be adding more issues to those available on DriveThruRPG.com in the weeks to come. Meanwhile, spread the word that there are 90+ Palladium Books titles available as PDFs on DriveThruRPG.com with more to be made available in the coming weeks. They currently include the Coalition Wars®/Siege on Tolkeen™ series, Splicers® RPG, The Rifter® issues #1-56 (with more being added soon), and first edition rules of the Rifts® RPG, Beyond the Supernatural™ RPG, Heroes Unlimited™ RPG, The Palladium Fantasy RPG®, and related 1st edition sourcebooks for each. And more! Like what? Like Fantasy Paper Miniatures and Game Master Kits for digital download. They are available only as PDF files and were designed special to help you run your games and build campaigns. There are also sneak previews of books and other good stuff. Check it out! And let other gamers know they are available too. We’ll be making more available on DriveThru in the weeks and months to come. So take a look on a regular basis. With demands of the holidays and business, I still have had very little time to work on Bizantium this week. Did some today. Maybe more over the weekend without other distractions. Good book and still scheduled for a January release. In keeping with the Christmas Spirit, I think I’m going to keep news and selling to a minimum, and share with you a nice array of the many Surprises Package comments from fans like you. Every year, in acknowledgment of our fans, and because they are fun to read, we offer a sampling of Surprise Package comments in the Weekly Updates throughout December. Our heartfelt thanks to all of you who have stuck with Palladium through thick and thin. Keep those imaginations burning bright, have a joyous holiday and brilliant New Year. Your comments and support mean the world to all of us. Everyone at Palladium enjoys reading your brief comments. They always brighten our day. Thank you. Since I haven’t been posting as much as I’d like, I have tried to write a short response [in brackets] when applicable. H.D. in Winston, Oregon, writes: I’ve been waiting all year for this [the Grab Bags]! I can’t wait to start reading [new game books] again! Keep the greatness going. J.Z. in Chesapeake, Virginia, writes: As always, Palladium continues to deliver amazing gaming material that I can’t help but love. Thank you Santa Kevin and Palladium team. Loyal fan and gamer since the early 1990s. I cannot express how much Rifts® has meant to me. J.M. in Montgomery, Illinois, writes: Once again, I look forward to the wonderful things that you will choose for my Surprise Package. I’ve been enjoying Robotech® RPG Tactics™ (the Kickstarter was well worth it! ), the Minion War™ storyline and Dead Reign®. I have to admit, my first impression of Dead Reign® was not very favorable, but was I wrong. I’ve gone on to enjoy it more and more as I read through the second sourcebook and gone back to look at the core book once again. I should know better than to doubt you all by now. One thing I never doubt is that the Christmas Surprise Package will deliver the goods and then some. I wish all of you the happiest of holidays and continued success. It seems like things are finally going the right direction for you all after too many tragedies, delays and setbacks. You have certainly earned some fair weather and smooth sailing, so here’s to a banner 2015 for Palladium Books! M.M. in Lebanon, Missouri, writes (in part): I’m 35 years old. I have been playing Palladium’s games since I was 14. My first character was a Trollish Long-Bowman in the Fantasy setting. I soon discovered the Rifts® setting and absolutely lost my mind in the genius of it. A.S. in Cottonwood, California, writes: Palladium, as a whole, has been an integral part of my life growing up. This Christmas Package is one of the best things I have ever seen. Been grabbing at least one every year for me and my family. Don’t ever stop printing and have a Merry Christmas. W.F. in Wylie, Texas, writes (in part): Rifts®! We love to play it as a family. My son and my brother and nephews and old friend get together to partake in the glory that is Rifts®! J.J. in Wayne, Michigan, writes (in part): Robotech® RPG Tactics™ is great! The rule book alone is beautiful. This kickstarter has made me happier than any other one I’ve participated in. I’m looking forward to seeing what Chuck Walton can do in the Fantasy book. I have high hopes for Bizantium. R.M. in Kent, Washington, writes: You guys make this the most wonderful time of year. J.B. in Elanger, Kentucky, writes: Thanks for continuing to do the Surprise Packages. They are awesome and always a joy to receive. Keep up the great work, Merry Christmas and Happy Holidays to Santa Kev and all the crazy elves at PB! B.W. in Barnstaple, Devon, Great Britain, writes: To all at Palladium Books, I love what you guys do over there and hope that you continue to be all about the game and the gamers. It’s rare to have a company that is so in touch and relatable to the fans. Congratulations on all your success and keep it going! Kevin – you are a massive inspiration and have been for many years now. Please don’t stop doing the things you are doing or change the way you do them!! The reason Palladium is so successful is because it is going in the direction you want it to. Keep it going that way. I wish all of you at Palladium a wonderful Christmas and a 2015 that is more successful than any year gone by. I like to make people happy. I’m often told that I’m crazy for doing the Christmas Surprise Packages, but then we get comments like these and it’s all so worth it. The Surprise Packages bring joy, and how awesome is that? I love that these Surprise Packages and our books often bring out that sense of childlike wonder and excitement. Love it. I’m thrilled that our words and art and actions inspire other people. I love that something as simple as this special offer and the time it takes to sign the books (albeit, a couple thousand books over the course of the offer) makes so many people smile and feel special. It should, because you are special, we appreciate you, and this is our way of letting you know that. Fun, laughs, a gathering of friends and epic (imaginary) adventure are what makes role-playing games so amazing. Whether you believe in the Christian faith or not, I see something good and worthwhile in spreading joy. And Christmas is as good a time as any, especially when there is so much commercialization of the holiday. It is sad that our world has become such a cynical place and so many people seem to look at everything from a perspective of suspicion and malice. I hope these Grab Bags have brought you joy, fun and a reason to game with some friends. Happy holidays from me and everyone at Palladium Books. May your adventures, real and imagined, always have a happy ending. Rifts®, The Rifter®, RECON®, Splicers®, Palladium Books®, The Palladium Fantasy Role-Playing Game®, Phase World®, Nightbane®, Megaverse®, The Mechanoids®, The Mechanoid Invasion®, Coalition Wars®, Chaos Earth®, Dead Reign®, and After the Bomb® are Registered Trademarks of Palladium Books Inc. RPG Tactics™, Beyond the Supernatural, Coalition States, Heroes Unlimited, Ninjas & Superspies, Minion War, Mysteries of Magic, SAMAS, Thundercloud Galaxy, Three Galaxies, Vampire Kingdoms, and other published book titles, names, slogans and likenesses are trademarks of Palladium Books Inc., and Kevin Siembieda.